This week we are pleased to bring you a guest blog from Mike Rose. In the post Mike discusses the background and clinical evidence to support pre-operative iv iron use. He also highlights a recently published article in the British Journal of Anaesthetics which has produced the algorithm shown to the left. In the Department of Health document on Enhanced Recovery there is information and reccomendations regarding anaemia correction in the pre operative situation. The document states that ‘Iv iron is quicker than oral iron’ and that ‘both are cheaper than blood’, but what is the background behind this and the clinical evidence to support iv iron use. There is strong evidence that pre operative anaemia is associated with post operative mortality and CV events in the elderly. Additionally blood transfusion has been demonstrated to impact on patients and is associated with increased likelihood of infection (wound and systemic), renal failure, prolonged ventilation, delirium, stroke, and both short term and long-term mortality. Various documents such as ‘Better Blood Transfusion’ have highlighted oral and iv iron as being effective and cheap. However, with little incentive to use less blood clinical practice has remained largely unchanged. It has been suggested that devolving budgets for blood to directorates would ensure that effective alternatives would get more appropriate consideration. The current ‘price’ of blood within UK Trusts is around £140 but publications have estimated the true cost of a unit to be more like £600. Some consider blood transfusion to be a liquid organ transplant and most would consider that if blood was assessed as a pharmaceutical it would not get approval. Overall the data is encouraging and larger international studies are being undertaken currently. Effective and rapid treatment of anaemia has traditionally been seen as requiring EPO (now termed Erythropoietin Stimulating Agents or ESAs). Recent studies and meta-analyses have raised doubts about the long term safety of these agents. In renal medicine and oncology guidelines encourage that haematological deficiencies such as iron are dealt with before initiating an ESA. Accurate assessment of iron status can reveal whether absolute iron deficiency (ferritin <30µg/l or >30 and <100µg/l if evidence of inflammation) or functional iron deficiency (FID) is present (ferritin 100-300 and Tsat < 20%). This diagnosis was used in the Anker NEJM paper in HF patients in 2009. Treatment with IV iron v placebo improved all QOL markers and NHYA class. As these patients were not very anaemic (mean Hb 11.9g/dl) it raises interesting questions about the beneficial role of treating iron deficiency even without anaemia. 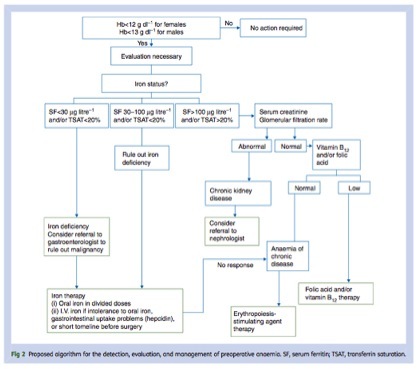 The ‘Detection Evaluation, and Management of Preoperative Anaemia in the elective Orthopaedic Surgical Patient: NATA Guidelines’ have just been published in the British Journal of Anaesthesics and can be downloaded for free by clicking here. These guidelines offer a timely opportunity to improve this aspect of surgical care and ‘improve patient outcomes’ in line with the ERAS approach.. In line with the SPCs of the IV iron preparations available, oral iron should be considered first line but data supports that oral iron may take weeks or months to be effective with good compliance whilst only IV iron can treat FID quickly and effectively. Some advocate a pragmatic approach and have a lower threshold to consider the use IV iron. Which patients groups respond best? Which markers can help predict response? IV iron has had a complex history with concerns over anaphylactic reactions. Newer preparations have overcome these issues and allow for large doses to be administered conveniently in one short infusion – even in non acute hospital settings. Perhaps as healthcare professionals the first thought regarding the various options for anaemia treatment could be – What treatment would you want yourself ? Full disclosure – Mike Rose works as a Medical Liaison Manager for Vifor Pharma UK Ltd . Many thanks for your comment and useful “rule of thumb”. Your site http://www.ukanaemia.co.uk is an extremely useful resource and i hope you don’t mind me signposting it for others. The most important thing to remember is that iron deficiency means blood loss. This will exhaust the iron stores and impair haemoglobin synthesis. Serum ferritin reflects the stores(no it is not an acute phase reactant) and red cell Hb(either Retic Hb or MCH) reflects the latter. So to cover an expected fall in Hb from 12g/dl down to 8 g/dl there should be additional iron stores equivalent to 4 x 20= 80 ug/l Serum Ferritin, if the base line was 20 ug/l then the total pre-operative Serum Ferritin should be 100 ug/l or more. Any failure in iron supply will limit Hb synthesis and red cells will emerge with less than 28 pg per cell-firstly as reticulocytes(RetHb) and then as mature red cells leading to an MCH less than 28 pg as the new cells become predominant.